I have to share this article I put up on notatourist.sg. Tomorrow is the last day to catch the show. Now that I've seen the show, I may have been wrong to compare Cirque Mother Africa to Cirque du Soleil. 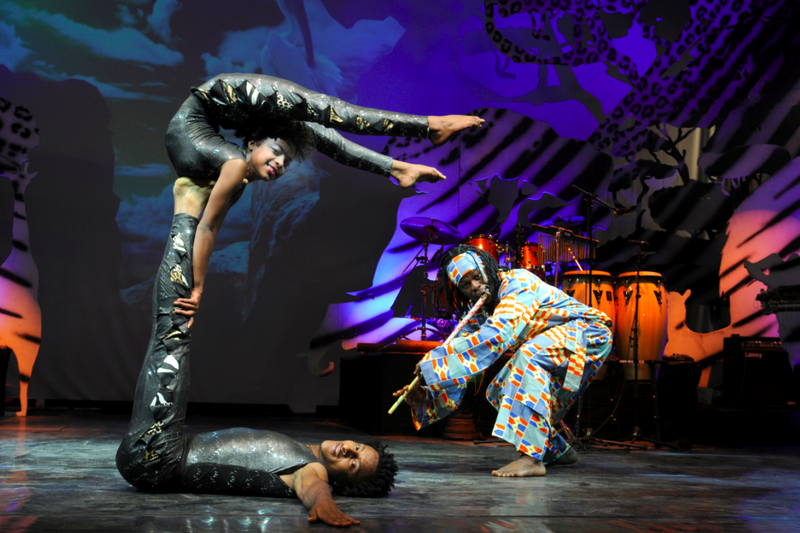 Besides its similarities in not being an ordinary circus that is usually filled with tightrope walkers, lion tamers and dancing elephants, Cirque Mother Africa has its own distinct identity, pulsating with a wonderful energy. Clearly I'm meant to be an editor of words on paper, not being on video! It's not too often that we see blatant injections of African culture here in Asia. As jaw-dropping impressive the acrobatics were, the real life of the show came from the musical segments based on traditional song and dance from various parts of the continent. I found myself tapping my foot to the beats, wishing I could dance with the same life that seemed to emanate from the very core of each of the performers. The children seemed to agree -- during intermission, we saw little girls flexing their knees and exuberantly bouncing their shoulders to tunes still stuck in their heads. Not to overlook the breathtaking acrobatics either, we witnessed a live record breaker of 51 back-flips in a row (previous world record held just under 40). And these were not your ordinary back-flips - a talented young performer was tossed those 51 times in the air by the legs of another (clip at 0:33). Stunning feats of strength were displayed by bulky Hulk-sized men, but even more impressively showed their agility as they landed softly as cats after flipping through the air. Tricks like riding impossibly tall unicycles were included, though the performer garnered the most pleasure from the audience when he mastered the tiniest unicycle I have ever seen (clip at 0:10). There were times when I held my breath as contortionists waved to us from inconceivable positions or as chiseled bodies scaled stacks of wobbly chairs to pose into positions that would rival any Olympian gymnast. I applaud the 40 performers here in Singapore for the very first time from Africa. If you haven't caught the show yet, you have one more day to get your tickets and watch the dazzling show at Esplanade.